The good news is that a large majority of reporters are within +/3Hz and has a good frequency stability. You can see how I calibrated my TRX before/after the night. Nothing really new, but for the newcomers to 80,160m and below bands, I've posted a few new plots, result of last night experiments on 80m. It is on my Picasa web-album. And move forward using the album arrows. It shows what kind of improvement can be expected from a simple magn-loop versus a vertical in a noisy environment (if you are lucky enough to have a very quiet location "man-made noise-free", it may not be that effective - A magn-loop is only effective to nul-out a local noise source arriving at low angle). It is not the first time I am doing such a tests, using a Magn-loop and/or a K9AY. More tests can be seen by following the links at the bottom of the last album picture. 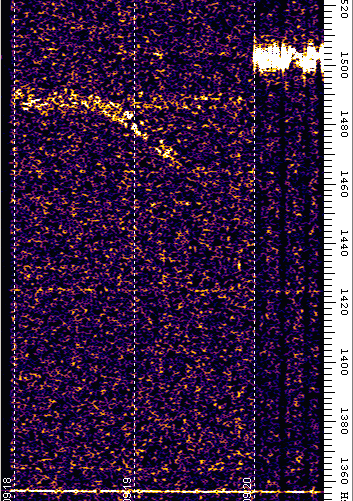 despite my very noisy location I received the SM6BHZ beacon immediately. made from Al recovered from the bin...)... magic ! quickly something to see if the 160m loop could be tuned down to 504kHz. limited, just approx +/- 1.5kHz at -3dB. I am adding the plot of this morning 40m test, involving VK7KRW (RX), DG0OPK and myself... (TX). We were both using 5W; DG0OPK uses a G5RV at 4m AGL and I am using a ground mounted 17.5m vertical (tuned with an AT130 auto-tuner). Please see forum topic "WSPR-DB data vs VOACAP model" for more details, comments and plots.